This recording of duets by the great composers of the Restoration is one of the gems of Hyperion’s catalogue. It features the celebrated countertenors James Bowman and Michael Chance at the peak of their powers, and the combination of their two voices with the sympathetic accompaniment of The King’s Consort creates something uniquely glorious. Purcell was a countertenor himself and in his writing for the voice produced some of his most felicitous music. John Blow, Purcell’s predecessor and successor as organist of Westminster Abbey, reached his compositional zenith with the extended duet (almost a small cantata) on the subjects of Purcell’s tragic early death and inextinguishable influence. With the restoration of the monarchy in 1660, music in England entered a rich period which many have argued has not since been surpassed. The age also brought about the beginnings, for Britain at least, of two social activities which have also lasted to this day: the introduction of opera, and the establishment of the public concert (rather than the renaissance idea of private or domestic music-making), although at the Restoration both were events limited to a rela­tively small number of Londoners. The church, up till then one of the principal sources for musical performance, though severely depleted of performers (particularly good boy choristers) by the abandonment of the Chapels Royal during the Common­wealth, managed to restore its former strong position and, over the next fifty years, supplied a wealth of fine composers and performers, of whom Henry Purcell and John Blow proved to be leading figures. The setbacks that Cromwell’s interregnum had brought to music-making did not prevent all performance (as Roger North wryly remarked, ‘many chose to fidle at home, than to goe out and be knockt on the head abroad’) but the Restoration of the monarchy brought a flurry of musical activity. The King was in a position to set an example of musical patronage to his subjects and offer opportunities greater than any other person. The national prestige, as well as the King’s own, depended in part on the splendour of the Court, part of which, in turn, was an official and brilliant musical establishment; and so the best composers and performers of the age tended to be on the royal payroll in some form or another (not that even the best in the land had any beneficial effect on the music-hating Lord Lauderdale, of whom Pepys wrote ‘he would rather hear a cat mew than the best musique in the world; and the better the musique, the more sicke it makes him; and that of all the instruments, he hates the lute most, and next to that, the bagpipe’). But, Lauderdale apart, music, especially at impor­tant occasions, was something which was liked by the majority of the Court (and welcomed by the musicians and composers for the extra fees that these could generate). Odes for royal birthdays, weddings, the welcome of state dignitaries and a host of other occasions became an important new source for compositions. Henry Purcell’s musical career, like that of so many British musicians, began in the church as a chorister of the Chapel Royal. He was obviously extremely gifted, for a three-part song by him, ‘Sweet tyranness’ (composed when he was only eight) appears in Playford’s Catch that catch can (1667). This attri­bution is not as improbable as it may at first seem, since a version for single voice was published eleven years later under Purcell’s name, and boys at the Chapel were encouraged to write music. When Purcell’s voice broke at what was then the unusually early age of fourteen, his musical talents were recognized and fostered first in his appointment as assistant to the royal instrument keeper, and then as tuner of the organ at Westminster Abbey. It was whilst he was employed in this position that he would first have come under the regular influence of John Blow, then organist of the Abbey, who was to become one of the most important influences on Purcell’s compositional style. In 1679 Purcell was himself appointed organist at Westminster Abbey, in succession to Blow, begin­ning a career which, in only sixteen years, established him as by far and away the greatest English composer of the age. (Blow, incidentally, holds the curious position of being both predecessor and successor to Purcell as organist at the Abbey, having taken over from him after Purcell’s untimely death). Purcell’s compositions involving voices, remembering his relatively short compositional span, are large in number. For the theatre he wrote an opera and five semi-operas (as North called them), and songs and incidental music for forty-three plays; for the church he wrote over a hundred anthems, ser­vices and other items of sacred music; for the court and other special occasions two dozen Odes and Welcome Songs; and for general consumption hundreds of songs, duets and catches, some of these latter examples being extremely rude ones! Purcell is reputed to have been both a good countertenor and a bass, and the quantity of his surviving music for the male alto is a good indicator of his fondness for this voice. Just as Purcell began his musical career as a chorister of the Chapel Royal, John Blow too, at the Restoration, came to London from his native Nottinghamshire, joining a choir whose members included Pelham Humfrey and Michael Wise, under the direction of Henry Cooke. After his voice broke (in 1664), Blow’s first major appointment, after a spell as some sort of assistant to the keeper of the royal instruments, was that of organist at Westminster Abbey, a post which he retained until Purcell took over in 1679. Blow also became Master of the Children of the Chapel Royal in 1674, retaining this important and influential post for the rest of his life. He thus exerted his influence of a whole generation of future composers and musi­cians, amongst them Jeremiah Clarke, William Croft and Daniel Purcell. Although Purcell and Blow worked under the same profes­sional conditions, and their compositions cover a similar field, there is a difference of emphasis in their two outputs. A large part of Blow’s output was of music for the church, for he did not share Purcell’s interest in the trio sonata or in music for the stage. Much of his secular vocal music was published in the collections of John and Henry Playford and, like almost all his output, shows a considerable amount of variety, both in content, but also, at times, in standard. Nonetheless, his best works show him as a composer of imagination and high stature. Sound the trumpet is a movement from the last of six Birthday Odes which Purcell wrote for Queen Mary between 1689 and 1694, Come ye sons of Art. The text, probably by Tate, is treated to one of Purcell’s most brilliant settings on a ground bass which, for variety, modulates through two related keys during the second section. In vain the Am’rous Flute comes from one of Purcell’s largest-scale Odes, that for St Cecilia’s Day in 1692, Hail! bright Cecilia. In keeping with the reference in the text to ‘the Am’rous Flute and soft Guitar’, the movement is begun and ended with instrumental writing for two recorders. With O solitude we come to one of Purcell’s finest songs, no doubt inspired by the extraordinary visionary text by Katherine Philips. Again, the song is based on a ground which does not vary from its minor key throughout its twenty-seven repetitions. This creates a quite hypnotic effect which, coupled with graphic word-painting even from the first phrase, makes it one of the greatest of all Purcell’s solo settings. Sing, sing ye druids comes from the 1695 production of Bonduca, or The British Heroine, an adaptation of Fletcher’s tragedy about Boadicea, for which Purcell wrote, only a month before his death, a considerable amount of music, both vocal and instrumental. Again, the movement is written over a ground bass which is treated to an ingenious array of transpositions and inversions to achieve variety, prefaced once again by an instrumental ritornello for two recorders. On the death of Queen Mary in 1695, a set of three commemorative pieces was published, containing two settings by Purcell, the duet O dive custos Auriacae and the solo Incassum Lesbia, and one by Blow entitled No, Lesbia, you ask in vain. O dive custos Auriacae is a fine setting of Henry Parker’s text (itself a clever piece of writing whose references to Oxford and Cambridge might have drawn approving nods from classical scholars) which shows Purcell’s florid and strongly Italianate vocal style, with the voices intertwining jagged melodic inter­vals amongst passages containing chains of discords. Southerne’s play of 1693 The Maid’s Last Prayer, or Any rather than Fail required only two songs and one duet, No, resistance is but vain. Its opening comic style is strongly reminiscent of the Coridon and Mopsa duet from The Fairy Queen, dating from only a few months earlier, but the duet also contains some contrasting and characteristically wistful writing at the mention of ‘sighs’ and ‘pain’. Incassum Lesbia was the second of Purcell’s contri­but­ions to the trilogy of Odes on the death of Queen Mary, written only a few months before Purcell’s own death, and published posthumously. Also known as ‘The Queen’s Epicedium’, it is set for solo voice, and falls into three sections. The central French-style triple-time movement is surrounded by two large portions of recita­tive whose mournful texts, full of references to tears and misery, enabled Purcell to show his skills at writing intensely chromatic vocal and harmonic lines, and his consi­derable abilities for graphic pictorialization with words such as ‘immodulata’ (‘discordant’). Blow’s charming setting of Ah, heav’n! What is’t I hear?, published in Amphion Anglicus in 1700, shows an elegant control of vocal line and an effective use of adventurous harmony, all contained within a compact and clearly defined structure. 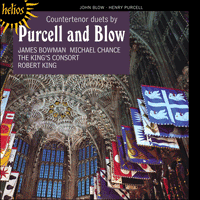 The duet is an excellent example which justifies the respect which Blow’s work received during his lifetime, and the unfairness of Burney’s attacks on his abilities as a composer. Blow is remembered as being not only the most important figure in the school surrounding Purcell, first as teacher of the master, but also as a good friend. It must have been therefore with genuine sadness that he set Dryden’s Ode on the death of Mr Henry Purcell. This is by far Blow’s most extended work for solo voices, and one that is of considerable musical interest. The Ode’s structure, a mixture of contrasting arias and a central recitative section, and the varied disposi­tion of the two voices, singly and as a pair, with or without the two alto recorders, along with the work’s rich harmonic and melodic language, single it out as one of Blow’s greatest works, and one which stands out as a unique work of the period. Blow’s regret, along with that of the entire musical estab­lishment, at having to mourn the loss of Purcell, aged only thirty-six, must have been similarly shared by the members of the combined choirs of the Chapel Royal and Westminster Abbey as, on 26 November 1695, they sang, for the second time in a year, the funeral responses Purcell had written only nine months earlier for the burial of Queen Mary. Normally they were a group of people who would have welcomed such an occasion for the extra fees it would have provided. This must have been one service at which they would much rather have not been present. La restauration de la monarchie, en 1660, marqua pour la musique anglaise le début d’une période faste, que beaucoup jugent insurpassée. Cette époque vit également l’apparition, en Grande-Bretagne du moins, de deux activités sociales qui ont encore cours aujourd’hui: l’opéra et le concert public (au lieu de l’idée renaissante d’une pratique musicale privée ou domestique), même si relativement peu de Londoniens y avaient accès. L’église avait toujours été l’une des princi­pales sources d’exécution musicale et, quoique très amoindrie (surtout au niveau des bons garçons choristes) par le délais­sement des Chapelles royales pendant le Commonwealth, elle parvint à retrouver sa solidité, produisant au cours des cin­quante années suivantes quantité de remarquables interprètes et compositeurs, avec Henry Purcell et John Blow en figures de proue. L’interrègne cromwellien et ses entraves à la pratique musi­cale n’empêchèrent cependant pas toute exécution musicale (comme le remarqua ironiquement Roger North, «beaucoup préférèrent violoner chez eux plutôt que de sortir et d’être frappé à la tête, dehors»), mais la Restauration entraîna une soudaine poussée de ce genre d’activités. Le roi put montrer l’exemple à ses sujets, en matière de mécénat musical, et offrir des opportunités comme jamais. Le prestige de la nation, et le sien, dépendait en partie de la splendeur de la cour, la­quelle était, en partie aussi, une brillante institution musicale officielle; les meilleurs compositeurs et interprètes tendirent donc à appartenir, sous une forme ou sous une autre, au per­sonnel royal (mais même les meilleurs artistes du pays n’eurent aucun effet bénéfique sur Lord Lauderdale, qui détestait la musique et à propos de qui Pepys écrivit: «il entendrait mieux un chat miauler que la meilleure musique au monde; et plus la musique est belle, plus elle le rend malade; de tous les instruments, le luth est celui qu’il déteste le plus, suivi de la cornemuse»). Mais, Lauderdale excepté, la majorité des membres de la cour aimait la musique, surtout pour les événements importants (appréciés des musiciens et des compositeurs pour les honoraires supplémentaires qu’ils pouvaient en retirer). Les Odes pour les anniversaires royaux, les mariages, l’accueil de dignitaires d’État et quantité d’autres événements constituèrent une importante et nouvelle source de compositions. Vu le temps relativement court qu’il eut pour composer, Purcell écrivit beaucoup d’œuvres vocales. Pour la scène, il rédigea un opéra et cinq semi-opéras (comme North les appela), des chants et de la musique pour quarante-trois pièces de théâtre; pour l’église, il composa plus de cent anthems, services et autres pièces sacrées; pour la cour et certains événements marquants, il signa deux douzaines d’Odes et de Welcome Songs; pour le grand public, enfin, il conçut des centaines de chants, de duos et de catches (dont certains fort grossiers!). Purcell passe pour avoir été un bon contre-ténor et une bonne basse, et ses nombreuses œuvres pour alto masculin disent bien la tendresse qu’il avait pour cette voix. De même que Purcell avait débuté sa carrière comme choriste à la Chapel Royal, John Blow quitta son Nottingham­shire natal, à la Restauration, et débarqua à Londres pour rejoindre un chœur dirigé par Henry Cooke et comptant parmi ses membres Pelham Humfrey et Michael Wise. À sa mue, en 1664, il fut brièvement l’assistant, en quelque sorte, du conser­vateur des instruments royaux avant de se voir confier son premier grand poste, celui d’organiste de l’abbaye de West­minster, où il officia jusqu’à la nomination de Purcell, en 1679. Également devenu Master of the Children de la Chapel Royal en 1674—un poste influent qu’il conservera jusqu’à sa mort—, il marquera de son empreinte toute une génération de compo­siteurs et de musiciens, dont Jeremiah Clarke, William Croft et Daniel Purcell. Malgré un environnement professionnel et une sphère compositionnelle similaires, Purcell et Blow imprimèrent à leurs productions une orientation différente. Blow, qui ne partageait pas l’intérêt de Purcell pour la sonate en trio ou la musique de scène, se consacra largement à la musique liturgique. Nombre de ses œuvres vocales profanes parurent dans les recueils de John et Henry Playford et, comme presque tout ce qu’il com­posa, elles sont fort disparates, au niveau du contenu mais aussi, parfois, de la facture. Les meilleures n’en dévoilent pas moins un compositeur inventif et de haute volée. Sound the trumpet est un mouvement de Come ye sons of Art, la dernière des six Birthday Odes composées par Purcell pour la reine Marie entre 1689 et 1694. Le texte, probablement de Tate, reçoit l’une des plus brillantes mises en musique purcelliennes sur une ground bass qui, pour varier, module via deux tonalités voisines pendant la deuxième section. In vain the Am’rous Flute provient d’une des Odes à très grande échelle de Purcell, celle pour la Sainte-Cécile de 1692 (Hail! bright Cecilia). Conformément aux mots «the Am’rous Flute and soft Guitar», le mouvement s’ouvre et s’achève sur une écriture instrumentale pour deux flûtes à bec. O solitude, l’un des plus beaux chants de Purcell, fut sans doute inspiré par l’extraordinaire texte visionnaire de Katherine Philips. De nouveau, cette œuvre repose sur un ground qui ne quitte jamais son ton mineur tout au long de ses vingt-sept répétitions. D’où un effet quasi hypnotique qui, joint à un figu­ralisme imagé dès la première phrase, en fait l’une des plus grandioses mises en musique purcelliennes pour voix seule. Sing, sing ye druids provient d’une production de 1695, Bonduca, or The British Heroine, une adaptation de la tragédie de Fletcher sur Boudicca, pour laquelle Purcell composa, juste un mois avant de mourir, énormément de musique vocale et instrumentale. Une fois encore, ce mouvement s’appuie sur une ground bass variée en un ingénieux panel de transpo­sitions et de renversements, précédée, de nouveau, par un ritornello instrumental pour deux flûtes à bec. À la mort de la reine Marie, en 1695, une série de trois pièces commémoratives fut publiée, qui réunit deux mises en musique de Purcell (le duo O dive custos Auriacae et le solo Incassum Lesbia) et une de Blow (No, Lesbia, you ask in vain). O dive custos Auriacae est une belle mise en musique du texte de Henry Parker (page ingénieuse dont les références à Oxford et à Cambridge ont pu recevoir l’approbation des érudits classiques), une illustration du style vocal fleuri et fort italianisant de Purcell: les voix entremêlent des intervalles mélodiques hachés dans des passages renfermant des chaînes de discordances. La pièce de Southerne The Maid’s Last Prayer, or Any rather than Fail (1693) requit juste deux chants et un duo, No, resistance is but vain qui, malgré un style comique inaugural rappelant beaucoup le duo entre Coridon et Mopsa (dans The Fairy Queen, antérieur de quelques mois seulement) arbore une écriture contrastive et typiquement mélancolique aux mots «sighs» et «pain». Paru à titre posthume, Incassum Lesbia date de quelques mois avant la mort de Purcell, qui signa là sa seconde contri­bution à la trilogie des Odes sur la mort de la reine Marie. Également appelée «The Queen’s Epicedium», elle s’adresse à une voix solo et comprend trois sections. Son mouvement ternaire central, en style français, est entouré de deux grandes portions de récitatif dont les textes funèbres, truffés de réfé­rences aux larmes et à la détresse, permirent à Purcell de montrer son art des lignes vocales et harmoniques intensé­ment chromatiques, mais aussi son immense aptitude à dé­peindre de manière imagée des mots comme «immodulata» («discordante»). Le charmant Ah, heav’n! What is’t I hear?, paru dans l’Amphion Anglicus en 1700, laisse apparaître une élégante maîtrise de la ligne vocale et un impressionnant usage d’har­monies audacieuses, le tout dans une structure compacte et clairement définie. Ce duo justifie à merveille le respect que Blow reçut de son vivant et prouve l’iniquité des attaques de Burney sur ses aptitudes de compositeur. On se souvient de Blow comme de la plus importante figure de l’école gravitant autour de Purcell—dont il fut avant tout le professeur—et comme d’un bon ami. Ce fut donc sûrement avec une authentique tristesse qu’il mit en musique l’Ode on the death of Mr Henry Purcell de Dryden qui est, et de loin, sa plus vaste œuvre pour voix seules, d’un immense intérêt musical. Sa structure, mélange d’arias contrastives et d’un récitatif central, la disposition variée de ses deux voix, en solo et en duo, avec ou sans les deux flûtes à bec alto, et sa riche langue harmonico-mélodique en font l’une des plus grandes pièces de Blow—une œuvre à part, dans cette époque. Comme Blow, comme tout l’establishment musical, les membres des chœurs combinés de la Chapel Royal et de l’abbaye de Westminster durent se désoler d’avoir à pleurer Purcell, mort à seulement trente-six ans, quand, le 26 novembre 1695, ils chantèrent, pour la seconde fois en un an, les pages funèbres que le compositeur avait écrites tout juste neuf mois auparavant pour les funérailles de la reine Marie. Ce genre d’événements, tous l’appréciaient en temps normal, ravis de recevoir des honoraires supplémentaires. Mais ce service-là, ils auraient préféré ne pas y assister.